We made these delicious, mouth-watering Spinach Enchiladas last week. I literally ate them for three days in a row because they were so delicious and a small serving was super filling. Plus they had veggies (and cheese oops!) This picture looks gross but trust me, this is so tasty! - In a bowl, mix the spinach, corn, 1 cup of the cheese and 1 can of the chiles. - In a separate bowl mix the cream, salt, pepper, and remaining can of the chiles. 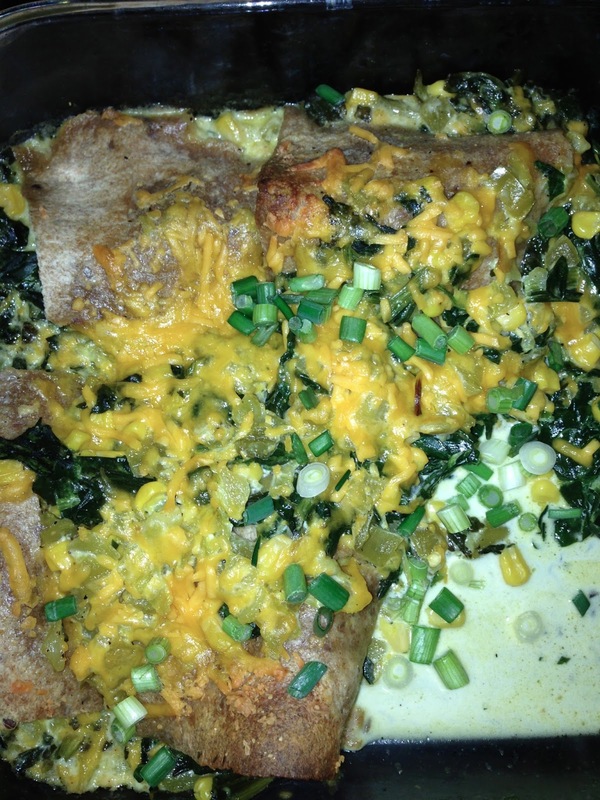 - Spoon the spinach mixture into the tortillas and roll up, placing seam side down in baking dish. I eyeballed the amount and made mine very full. - Pour the cream sauce on top and sprinkle the rest of the cheddar on top. - Cover with foil and bake until bubbling, 15 to 20 minutes. - Uncover and bake another 15 to 20 minutes, until golden. - In a separate bowl, toss the cabbage and lime juice and season with salt and pepper. Pour over enchiladas when serving. I found the recipe on Pinterest via Real Simple. I adapted it to our tastes. Make these asap. I cannot tell you in typed words how flipping delicious these were! Ι'm really inspired together with your writing talents as well as with the format on your weblog. Is this a paid subject matter or did you customize it your self? Anyway stay up the nice high quality writing, it is uncommon to see a nice weblog like this one nowadays..